The ProLibertad Freedom Campaign - U.N. Campaign for Ana Belen! Click here for more information Ana Belen Montes's case! Our UNITED VOICES will free our sister Puerto Rican Prisoner of Conscious Ana Belen Montes! As of September 1st, there's a new United Nations High Commissioner on Human Rights, former President of Chile Michelle Bachelet Jeria. She has a long history of supporting human rights campaigns and social justice issues; it's time she learned who Ana Belen Montes is! We need your help in order to bring Ana's case to Bachelet Jeria's attention. 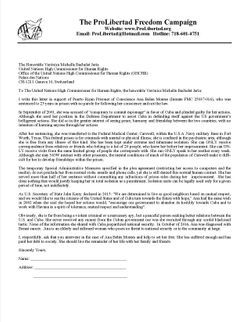 ProLibertad is calling on all our allies to download the letter below, sign it, and then mail it to High Commissioner Michelle Bachelet Jeria. The goal of this campaign is to motivate her to intercede on Ana's behalf. Every letter moves us closer to freedom and justice. Download the letter, make copies, ask your friends and family members to sign, and mail them all out! 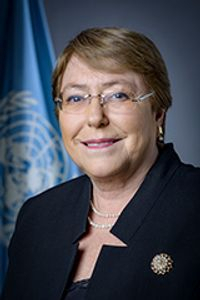 On September 1, 2018 Michelle Bachelet Jeria assumed her functions as the United Nations High Commissioner for Human Rights. The Office of the High Commissioner for Human Rights was established in 1993 and Ms. Bachelet is the seventh Commissioner. Ms. Bachelet was elected President of Chile on two occasions (2006 – 2010 and 2014 – 2018). She was the first female president of Chile, as well as Chile’s and Latin America’s first female Defense Minister (2000 – 2002). She also served as Health Minister (2002 - 2004). In 2011, she was named the first Director of UN Women, an organization dedicated to fighting for the rights of women and girls internationally. Economic empowerment and ending violence against women were two of her priorities during her tenure.